In the automotive world, Audi has a more fascinating history than any other automobile company that I know of. While various books have been written that discuss and illustrate Audi's history, none approach it from a collectibles point-of-view! 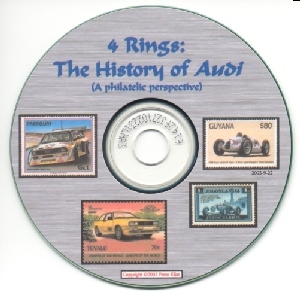 I discuss and illustrate Audi's history through stamps, postmarks, postcard, Quartett cards, models cars and a wide variety of paper collectible items going back to about 1908 !